It seemed unthinkable just a few weeks ago, but Jeonbuk’s 2011 bribery scandal finally delivered just desserts as FC Seoul seized the day with their first K League title in 4 years on the final matchday, putting an end to Jeonbuk’s three-peat dreams. We’ll probably have a full K League retrospective in the coming weeks (and it’s not all over, with promotion playoffs, FA Cup and Asian Champions League still left to enjoy), so let’s just talk about this final game. All season long, despite Jeonbuk and Seoul being tipped as the two title favorites, the Green Machine pulled away round after round after round with win after win after win. Seoul simply could not find a way past Jeonbuk under Choi Yongsoo, but eventually it was Hwang Sunhong’s tactical acumen, combined with Jeonbuk’s waning end-of-season performances, that gave Seoul the victory on the final matchday. Both teams came into the match level on points, but Jeonbuk had the most goals scored by virtue of strong performances in their previous two matches (5-0 @ Jeonnam, 4-1 v Sangju). Therefore, Seoul needed a victory to steal the title, whereas Jeonbuk could do with just a draw. Choi Kanghee’s side lined up in their traditional 4-1-4-1 with Shin Hyungmin as the holding midfielder this time and Kim Shinwook starting up top. Hwang Sunhong’s side once again deployed a 4-3-3 that gives them great control of the match, by virtue of three solid, complimentary central midfielders – Osmar, Joo Sejong and Yojiro Takahagi – and also width up top. The surprise however was Hwang’s decision to play little known 21-year-old midfielder Yoon Seungwon ahead of Adriano or Park Chuyoung, presumably to ensure they would be allowed 3 substitutions by adhering to the U-23 rule (which Jeonbuk did not, leaving them at just 2 subs). Both teams’ efforts were restricted to long-distance in the first half. Jeonbuk obviously looked to create problems with Kim Shinwook’s height, and it certainly contributed to the right side of Seoul’s defense coming off as shaky, but no dice. Then, in the 37th minute, Hwang Sunhong took off surprise starter Yoon and brought on Park Chuyoung. Confirmation that Yoon’s K League debut was only used here to bypass the U-23 rule. Tempers rose from here on out, with Kim Bokyung being denied a penalty shout and scuffles after fouls. With Seoul now with one-hand on the title, Jeonbuk were on the offensive. But the number of high-quality chances were few and few between, a testament to Seoul’s midfield covering ground and closing down opportunities. Lee Jaesung was the easiest remedy making nimble forays into the box, but the finishing touch wasn’t there. Kim Hyungil, however, had a chance to score a spectacular winner in the 95th minute with a free header off of a corner kick, but Osmar did just enough to force the Korean centreback’s effort wide. Another corner would be punched away by Yoo Hyun, and fulltime came – Seoul with their first league win against Jeonbuk, just that side’s second league defeat of the year. Korea was red. For my quiet dislike of Jeonbuk, it still feels somewhat unfair to this group of players. They were the most formidable side the K League has seen in years, a dominant force and creator of high-quality opportunities through dynamic wingers and creative midfielders. Two defeats – one strange one against Jeju in a new shape with a B side – and the other, when it mattered most – combined with 9 penalty points for a bribery scandal that few left at the club had anything to do with – was their downfall. An opportunistic trophy for Seoul? Sure, though you cannot say it wasn’t well-deserved. They overcame the traditional managerial transition bump and have found a dominant 4-3-3 formation that works, and could very well be next season’s shape to beat with the right players to fit the system. And you couldn’t be happier for Park Chuyoung, who didn’t have the best of seasons given Adriano and Dejan’s dominance, but he and Yun Illok paid back Hwang Sunhong’s faith in them by combining for a simple yet super counter-attacking goal that is the envy of any post-2002 Korean national team side. Speaking of Hwang Sunhong, what an incredible manager. 3 trophies at Pohang and a league title on the final matchday – and now another trophy to savor, building off of the great work of former manager Choi Yongsoo. Hwang Sunhong: best Korean manager today? Hell yes. Suwon FC have been relegated from the 2016 K League Classic, and it unfortunately isn’t much of a surprise. The side promoted through the playoffs in 2015 seemed to be doing things right with promising foreign players. Unfortunately, they were mostly bust, and a 1-0 loss to a dominant Incheon side secured their fate. They will be replaced by 2016 K League Challenge runners-up Daegu (Ansan, league champions, cannot be promoted). Against all the odds, it’s Seongnam, who fell at the Steelyard, who pay the consequences of winning just one game in their last 12 matches. Meanwhile, nothing else really mattered on the final matchday – Jeju won 3-0 against Sangju, and finished the season on 71 goals scored over 38 games (as did Jeonbuk), the best goals/game ratio since Jeonbuk 2011. They will take their formidable goal-scoring form into next season’s Asian Champions League. Gwangju drew the now-safe Suwon Bluewings and “The Patriot” Jung Jogook scored his 20th goal of the season. 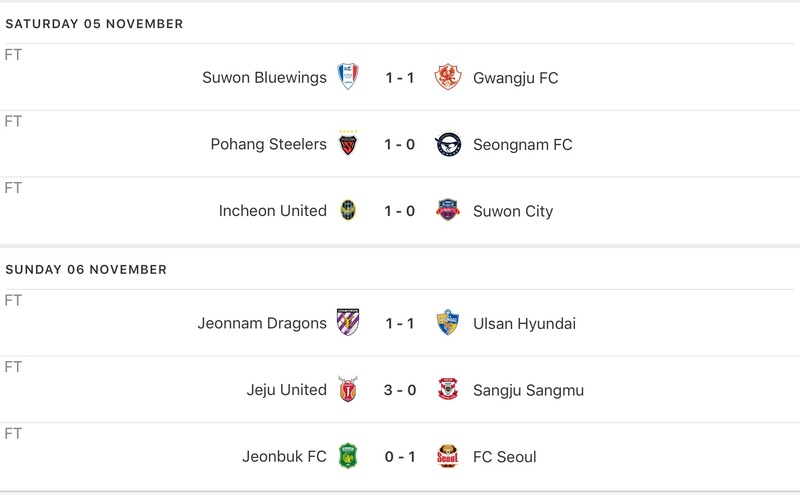 It’s the first 20-goal season in the K League since the 38-game schedule was brought in. 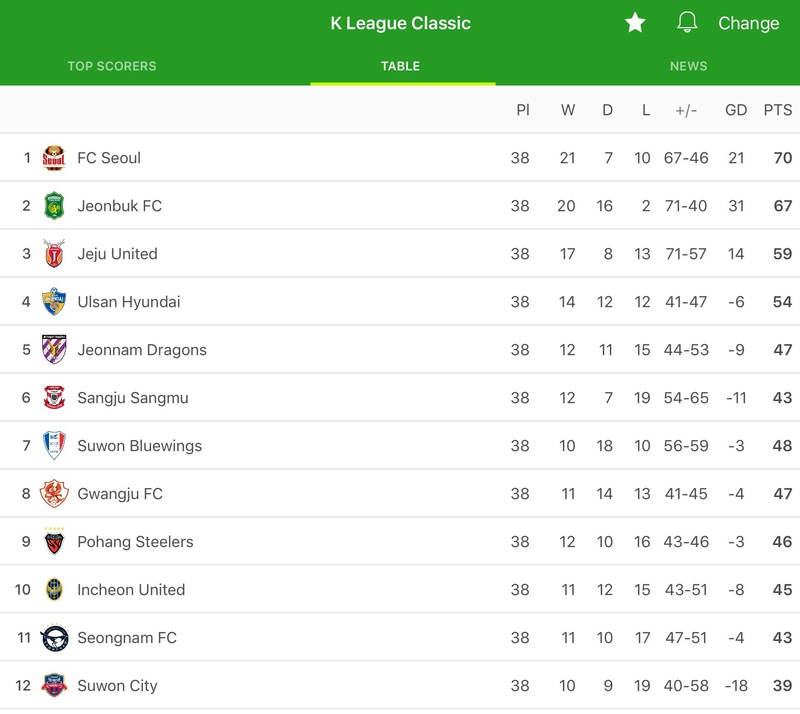 Jeonnam also closed a highly-successful season with a 1-1 draw against Ulsan – both sides will be hoping for ACL berths, the former hoping for an FC Seoul FA Cup win combined with a Jeonbuk suspension from 2017 ACL, the latter just hoping for Seoul FA Cup glory. After Gangwon disposed of Busan I’Park in the first playoff match, Gangwon continued their foray through the playoffs with a last minute 2-1 win at Bucheon. Former FC Seoul player Jung Seungyong opened the scoring for Gangwon in the 17th minute, but Bucheon struck after halftime. Knowing that a scored draw would send Bucheon through, Gangwon took advantage of a one-man advantage they had and scored yet another late winner through Brazilian forward (part of the 2012 Ulsan Hyundai ACL winning side) Maranhao. This sets up a promotion playoff over two legs between Seongnam FC and Gangwon FC. The first leg will be held in Gangneung on November 17th, and the return leg is at Tancheon Stadium on November 20th. Will Gangwon return to the Classic thanks to Brazilian firepower (somebody buy their scouts a soju). Or will Seongnam ensure a 28th consecutive season in the top division? as a FC Seoul fan, I sure was happy that day. 🙂 go park chu young! lol were those jeonbuk fans in the video? i was disappointed at the lack of reaction after PCY’s goal and then thought to myself, maybe those are jeonbuk fans. yes, in the camera angle, tons and tons of unhappy Jeonbuk supporters. The FC Seoul support was at that end (I think) but you just couldn’t see them from that angle. Looked like a lot of people there. I think in the end, while Jeonbuk may not have the domestic league title, they are positioned well to win the Asian title, still room for those supporters to have reason for cheer. Lol the Jeonbuk fans sure don’t look happy at his goal. The K League clubs have time and time again won ACL’s. I would say we have the best league in Asia. I predict Jeonbuk will win this one for Korea. Not a fan of Jeonbuk but of course I would love for a Korean club winning at the ACL. So yeah, the fans still have something to look forward to. Good to hear from you Roy! You excited for our upcoming national team matches? And the women’s team crushed Guam 13-0 I’ve heard. Wow. and oh yeah just realized something. North Korean clubs aren’t in the ACL. I wonder if there are reasons for that. They’re got a team in the AFC Cup, which is like a second-tier Champions League with clubs from Iraq, Malaysia, Turkmenistan, etc. I would say Jeonbuk players were robbed due to the scandal… but when you lose to FC Seoul in the ACL semi-final 2nd leg… and then you lose to FC Seoul again at home in the most important decider… then they have only themselves to blame. GO FC SEOUL! They beat Jeonbuk twice in a row so I say they deserve it. Not feeling too bad for Jeonbuk though… I think the ACL Silverware is probably the most important for any Asian football club.